The Royal Astronomical Society of Canada maintains extensive archives at its Toronto head office at 203-4930 Dundas St W. The archives are non-circulating. Visitors may contact the Society's National Archivist, or call (416) 924-7973 to make arrangements to conduct research on site, to arrange a consultation with the Archivist, or to request a document search (subject to available resources). A small fee may be charged for photocopying, or other services. Researchers are permitted to use their own photographic equipment subject to the Archivist's approval based on the state of preservation of the documents. The Society's National Archivist is R.A. Rosenfeld. In an effort to make the RASC archives more accessible to members and the public, materials are being digitized and placed online. Online materials are organized by decade, accessible via the links at left. In addition, several other pages on this website contain additional archival materials (see links at left, under "National Archives"). 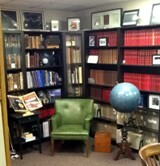 The RASC maintains a rare book collection as part of its Archives. Volumes date from ca. 1700 to the present, and include manuscript as well as printed items. The Rare Book Collection is non-circulating. To consult the Rare Book Collection, or to inquire about its holdings, please contact the Society's National Archivist, or call (416) 924-7973. These works are in the course of being catalogued. There is an online collection of autographs and ownership inscriptions from books in the portion of the former RASC National Library transferred to the Canada Science and Technology Museum (Ottawa) in 2009. The Society also has a small collection of meteorites, impactites, and meteorwrongs on display at national office. The first catalogue was publsihed during the International Year of Astronomy in 2009, with supplements appearing in 2010, 2011, and 2015. Access to these astromaterials for study is by application to the Archivist. The RASC Archives have recently accessioned the archive of the Associate Committee on Meteorites of the National Research Council of Canada (ACOM), and its successor body the Meteorites and Impacts Advisory Committee of the Canadian Space Agency (MIAC). A brief description of the nature of the ACOM and MIAC Archives is available here. A descriptive calendar of the ACOM-MIAC documents is now available.To consult the ACOM and MIAC Archives, please contact the RASC Archivist. The Archives also have small collections of Canadian-themed numismatic and philatelic materials, as well as astronomical instruments. These are in the course of being catalogued. Access to these for study is by application to the Archivist.